I downloaded sdk 1.3 from sun this afternoon, the newest version of the java developers kit, i had an earlier 1.1.x version running before. I also grabbed jbuilder 4 from borland, we had been using version 2 for class. It’s the same program, albeit a little bit more userfriendly. However it’s not the most userfriendly program to begin with. I also discovered the ver 1.3 of the java developer kit is bundled in jbuilder 4, so i didn’t have to download it. I also found out that they decided to use a new textbook this semester for the computer course that I took last semester, so I probably wont be able to sell it if I want to. Well, I can probably get rid of it, i just won’t get as much for it. It’s wonderful having an 18 month turnover period for the software and hardware associated with computing, it’s not great when the textbooks are only good for a year or two though and doesn’t have that much resale value. Unlucky more than anything I guess. The course one level down from that used the same textbook, so the people that are in it now are probably more angry that they have to get a new one. I’m wanting to watch the teaser trailer for lord of the rings but real player is insisting on downloading updates and taking it’s time doing so. It just finished downloading some parts and is now telling me I need more parts, who knows. It and windows media player both try to take over your computer, we need different video players. Deadlines are fun to work with, I tend to get a lot more accomplished if they are closer rather than farther away. Three assignments, a quiz, a website to get done, all by friday. It makes the weekend appear much more inviting. The realization that in a few days it all be behind you, and then you get to start again on the next batch. I finished off the computer assignment this afternoon. I’ll head down and do those much needed loads of laundry and plug away at the algebra assignment. Last night I went curling for the second time since i’ve been back at school. Before that I hadn’t gone out in at least eight months. I actually played pretty well last night and ended up sticking a great shot to win the game. I watched Titan AE while I was doing some work this afternoon (and evening). It thought it was a decent movie, the animation and story were alright. I liked it better than a lot of the animated fare i’ve seen come out from disney in recent years. 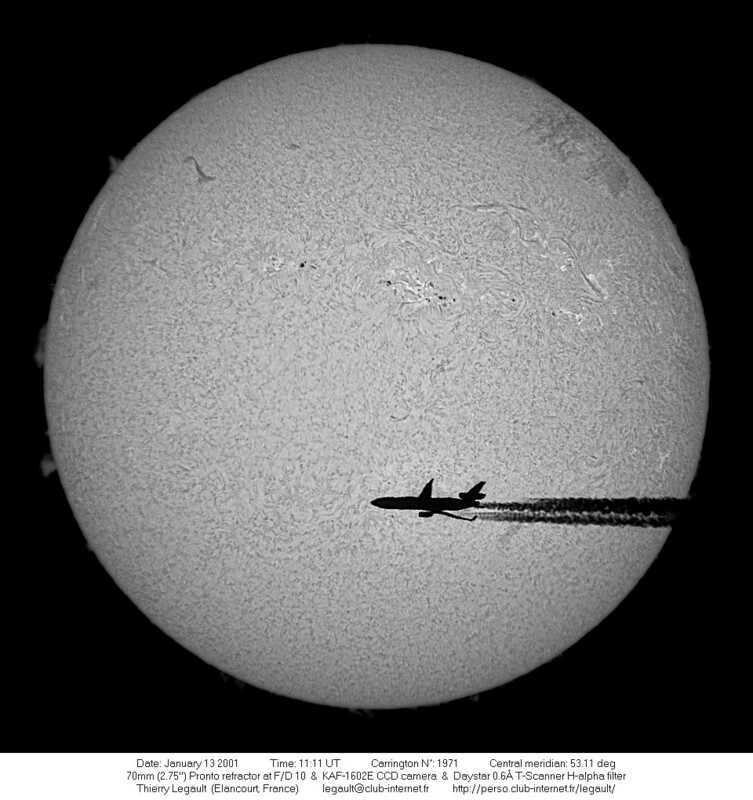 There’s a picture at the nasa site of a plane flying in front of the sun, it looks pretty cool. I went to a presentation tonite on microsoft tv with some talk about the .NET initiative. They having some interesting connectivity things going on. The ability to have different devices intereact with the internet (with most of your data online) and with each other. Wireless technology and calenders and whatnot. It sounds pretty amazing in theory, but there are some underlying issues with privacy and information overload. I asked the presenter about privacy, i think my question was a little too vague, because he skirted some of the problems. His response mainly entailed data security involving biometrics, like having to have a finger print or retina scan to access your personal data. That’s great, some average joe can’t figure out what my schedule for the day is but what about corporations? He was talking about your cell phone knowing where you’re located and targeted advertising, perhaps getting offered coupons to a store you walk by, or information about it, maybe a little add will popup. With these devices sending data back and forth, corporations will know more about us than the government. There will be digital copyright management to protect the intellectual property of these company’s but there will be very little in place to protect the identity of the individual. My internet connection is being flakey as hell tonite, things aren’t loading properly. I’m assuming that it’s a problem with the queen’s servers rather than the internet sites themseves. Just a fun weekend, hanging out with friends here. My parents and one of my brothers decided to pop up and see me yesterday. I hadn’t seen them since the holidays, so it was nice. Now i have a week full of assignments to look forward to, hunker down and work hard. Anabu-kin-chan, a commercial for a japanese construction company, it has a racoon with giant testicles and other woodland creatures with giant breasts. Go figure. I forgot to mention that the queen’s engineers finally got their pole back last week.